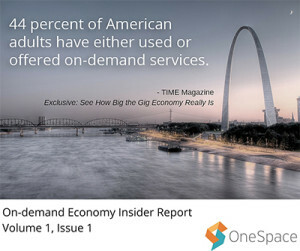 Welcome to the first edition of On-demand Economy Insider Report, where we bring you up to date on recent developments in crowdsourcing, the sharing economy and other related topics. This week, we’ll cover a large TIME poll on the gig economy, a CEO’s predictions for on-demand work and the latest news regarding ride-sharing services. TIME news magazine partnered with Burson-Marsteller, a global public relations firm, and the Aspen Institute’s Future of Work Initiative to create a wide-ranging poll on the sharing economy. The poll, published Jan. 6 along with an article by Katy Steinmetz and an infographic, queried both users and “offerers” (those providing services) about their experiences and satisfaction with on-demand services. The information comes from online interviews with 3,000 American adults, conducted last November. Among the interesting data points: 44 percent of American adults have either used or offered on-demand services, while 22 percent have provided services. Among the “offerers,” 71 percent their overall experiences have been positive. Chriss provides a wealth of data to back up his points, arguing that workers are choosing opportunities in the gig economy because they’re beneficial, not because they lack other options. Branding something as “Uber for [your service here]” will be no guarantee for success, whereas widespread freelancing will continue prosper. Those are just two of the predictions that Micha Kaufman, the CEO of Fiverr, provided to VentureBeat in a Jan. 4 post. You need a better pitch than “It’s Uber, but for ‘X’”: Kaufman says the private market is correcting itself as venture capitalists realize previous valuations have been too aggressive. Freelancing isn’t going anywhere: The author points to reports indicating that most freelancers are happy with their jobs and foresees an evolution in contractor benefits. Scale matters in startups: Kaufman says creating a startup is easy enough, but the challenge will continue to be whether it can scale. Legacy industries, watch out: Almost any traditional business can be disrupted by on-demand service, Kaufman argues. Ride-sharing services such as Uber and Lyft are really putting the pinch on traditional cab services. In San Francisco, where both Uber and Lyft have their headquarters, the local Yellow Cab service expects to soon file for Chapter 11 protection. However, Rodriguez reports, the current plan is only to restructure, not to close up shop or alter present services. The company is cooperatively owned by about 300 shareholders. Speaking of ride-sharing services, General Motors has invested $500 million in Lyft, with part of its focus on creating an on-demand network of self-driving cars. As reported Jan. 4 by Mike Isaac in the New York Times, another aspect of the plan is arguably as novel as a self-driving car: Lyft and the car manufacturer hope to develop a process by which potential Lyft drivers who do not own cars can borrow them to provide rides. The partnership could have shades of “if you can’t beat them, join them”: Isaac’s article notes that automobile manufacturers are concerned that the rise of ride-sharing companies could lead toward lower car ownership numbers.